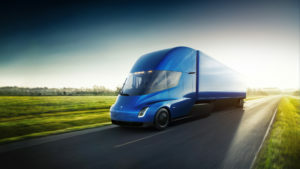 Lithuanian logistics company Girteka Logistics is the first in Europe to buy the new Tesla electric truck. Elon Musk unveiling the new Tesla artic. The Tesla artic, which was unveiled by the Elon Musk this week, consumes less than two kilowatt-hours of energy per mile and is capable of 500 miles of range at GVW and highway speed. The truck achieves 0-60mph in five seconds, compared to 15 seconds in a comparable diesel truck. It does 0-60 mph in 20 seconds with a full 80,000-pound load, a task that takes a diesel truck about a minute. “Girteka Logistics want to be the greenest transportation company available, and electric trucks are the future,” said Edvardas Liachovicius, CEO of Girteka Logistics.